Areas of protected nature are a measure of the state to preserve natural values and biodiversity in situ. They cover almost 14% of Slovenia’s territory. The largest and the oldest protected area is Triglav National Park, covering almost 84,000 hectares. In recent years, the total surface area of protected areas has expanded, largely due to the designation of five larger parks. This indicator shows the surface area of protected areas in Slovenia with regard to the type of protection and the category in accordance with the criteria of the International Union for Conservation of Nature (IUCN). We differentiate among large (national, regional, landscape parks) and small (strict nature reserves, nature reserves and natural monuments) protected areas where prescribed protection regimes apply. To increase the proportion of protected areas in various categories by 10% to 22% of the Slovenian surface area by 2014. Slovenia has exceptionally diverse landscapes and rich plant and animal diversity. It also has many people who, through living in close proximity to nature, have become aware that humans and nature are irrevocably interdependent. The establishment of protected areas is one of the most important (and oldest) mechanisms for conserving plant and animal species and their habitats. 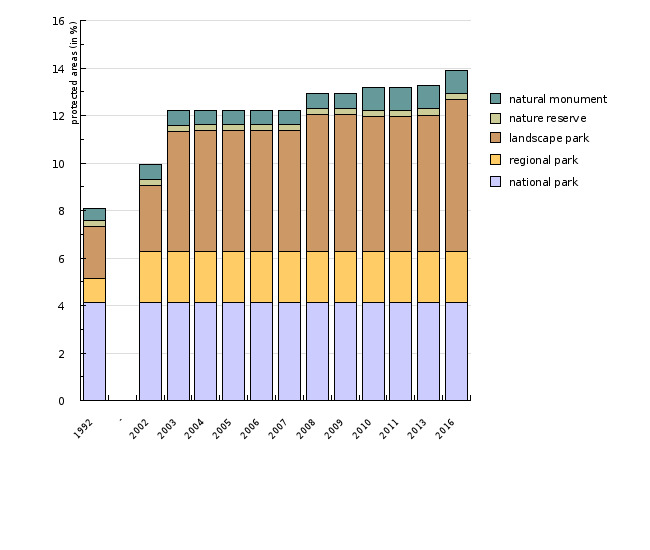 Data for the period up to 2004 show that the share of protected areas was increasing continuously. A significant part of protected area belongs to the only national park in Slovenia, Triglav National Park, which was first protected in 1981. In 2010, its surface area was extended by 174 ha, which is almost 0.01% of Slovenia's surface area. The protected surface area has increased recently, mostly owing to the designation of four large parks, i.e. the Notranjska regional park in 2002, Goričko landscape park in 2003, Ljubljansko barje landscape park in 2008 and Radensko polje landscape park in 2012. There are currently 3 regional parks, 1 national park, 45 landscape parks, 1 strict nature reserve, 55 nature reserves and 1,164 natural monuments in Slovenia that are protected by state and municipal acts. Protected areas partly overlap with Natura 2000 sites. They cover a smaller surface area than Natura 2000 sites; however, their management is better organised through management plans and designated managing entities. Objectives and legal basis: The objective is adapted from the Resolution on National Environmental Action Plan 2005-2012 (ReNPVO. Official Gazette of the Republic of Slovenia, 2/06).